On Sunday, an interesting call came in to the city. A lost parrot was sitting in a tree. The tropical bird had been loose for three days in some bone-chilling winter temperatures, so it needed help. LaVergne police officer J.B. Kilmon was dispatched to the scene and soon Vice Mayor Chris Farmer and Nashville firefighter Ronnie Mosley (the mayor’s husband) joined him. And then a tree service came to help. During the efforts to capture the elusive bird, both Mosley and Farmer were injured. However, even after the bird drew first blood in the fracas (name him Rambo, I say! ), he found a champion in the vice mayor. 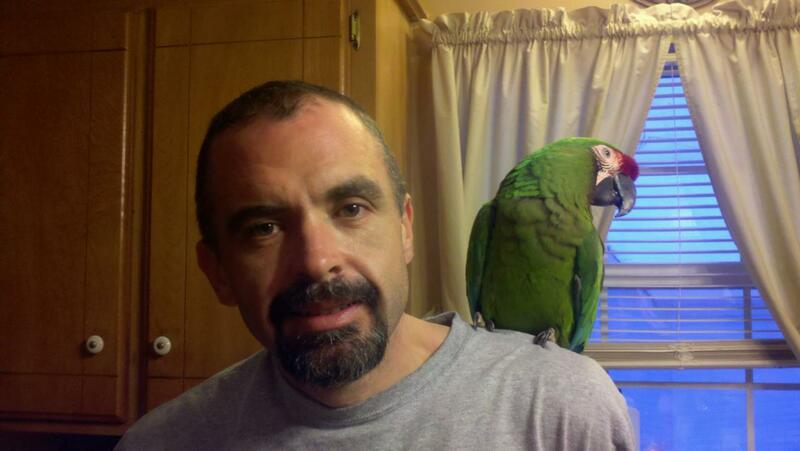 He and his wife took the green-feathered military macaw – a breed that is usually even tempered, but can also be difficult and cranky – to the veterinarian. The poor thing need some TLC after its trauma and who better than an EMT? 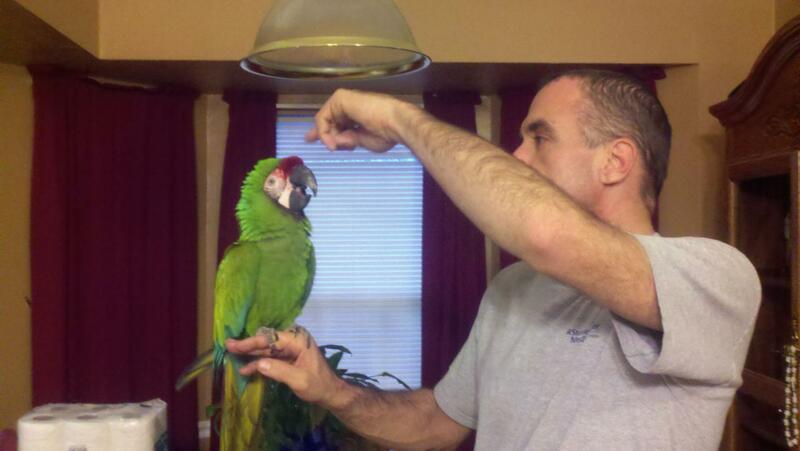 After neighbors investigated, they found Petey’s owner. She had already planned to give the 10-year old up for adoption, so graciously said the vice mayor could keep him. So what do we know about Petey Farmer? His favorite snack is a lemon cookie (where he eats the filling first). He loves hot showers and then being blow-dried. He does know some dirty words. He loves dogs. And he will try not to bite his Papa anymore. Congratulations to the Farmer household on heir newest addition! Posted on January 21, 2011 by Kathy T.
Posted on January 8, 2011 by Kathy T.
Posted on January 3, 2011 by Kathy T.
Before we begin, I just want to tell you that the potato soup really *was* good despite what (rhymes with) Heave-Ho said. The biggest news happening right now in LaVergne is that a search is underway for a new city administrator. Click here to read the job description and information about applying. You have until January 8th to apply. Here is a GREAT change in one of the position requirements: Must currently live in the City of La Vergne or must be willing to move to the City of LaVergne within 6 months of accepting the position. I really like that the person who is making the decisions that will impact this town has to live with these decisions by living in this town. Wise. The LaVergne Public Works Department will be accepting live Christmas trees through January 21st, 2011. All decorations, tinsel, garlands, lights, etc. must be removed from the trees before dropping them off. Trees may be dropped off at the Public Works Building located at 148 International Blvd. Signs will be posted as to where to leave the trees. My tree has been undecorated and dropped in the attic. Some ornaments were harmed in the process. Posted on December 14, 2010 by Kathy T.
UPDATE to add DNJ article link: LaVergne OKs severance deal. A motion was made and seconded to accept option 1 which provided a 3 month separation and release package for Mark Moshea. After lengthy discussion, Mayor Mosley, Alderman Farmer, and Alderman Broeker voted Yes to accept the package. Alderman Green and Alderman Waldron voted No. The motion was passed. Mayor Mosley said that since option 1 was accepted she motioned to deny option 2. Alderman Farmer seconded. After discussion, Mayor Mosley, Alderman Farmer, Alderman Green, and Alderman Broeker voted Yes to deny option 2. Alderman Waldron voted No. The motion was passed. The third item for discussion was for appointing an interim City Administrator. Mayor Mosley nominated City Recorder Bruce Richardson and at least three Aldermen seconded. After many positive comments regarding Mr Richardson’s work the measure was unanimously accepted.